Is that what you ran? You have your hands full m.
Yes, it is better than copying and pasting the same code 10 times. Oy! You do not have to copy and paste. You can rerun a cell again and again. The front end in Mma is confusing. He needs to learn its capabilities. Hm, but then how do I show you what the history was? Also, why is nestlist inferior? Good point just as long as you know the other way. Now where does x = 0. come from? I'll have my breakfast and watch 8 simple rules. That'll take 20 minutes. I do not know where x = 0 comes from. You supplied that. Before doing any rootfinding we check the geometry of the equation. 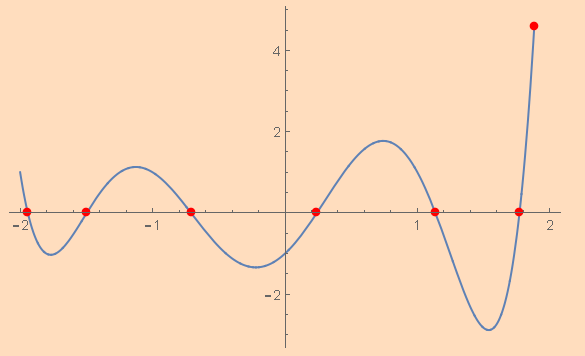 Plot the function and eyeball the roots. What do you see? What do you notice about the roots from looking? That is where the 0 comes from. Now get the remaining 5 roots. Can you clean that output up, there are duplicates? 100 in that argument seems excessive for 6 digits. Do you know why? Newton's has what they call quadratic convergence, that means it roughly gets twice as many correct digits with each iteration. That is a very high rate. There are some with cubic convergence or more.